The Marine Mammal Center : Pacific White-sided dolphin Rescued! During the necropsy of the dolphin this afternoon, veterinarians did find a hemorrhage at the base of the brain and hemorrhage in the intestines, but it is not clear what caused it and if that was the cause of death for her. Heart, lung, lymph nodes, stomach, intestines, brain, kidney, liver and other tissues, will be sent to another lab for histology so that pathologists can try to identify which tissues are normal and which are diseased and attribute specific diseases to any abnormal cells. Sadly, at approximatley 8:45 p.m. Wed. night, Pacifica died while in her pool. She was swimming unassisted just minutes prior. Veterinarians do not have a diagnosis for cause of death but surmise that stress is likely a factor. Today they will perform a necropsy to try to get more information about this animal and determine cause of death. The first 24-hours are extremely critical for rescued cetaceans and usually less than 5% survive. Volunteers from The Marine Mammal Center rescued a 4-to-5 foot-long Pacific White-sided Dolphin that had stranded at Rockaway Beach in Pacifica, CA on February 16, 2011. Named "Pacifica" by her rescuers, the juvenile, female cetacean is in fair to good body condition with minor traumatic lesions. 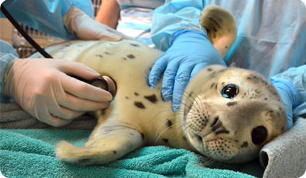 She is in critical condition and is under 24-hour medical care at The Marine Mammal Center, and will undergo diagnostic tests to determine her health and possibility of survival. In the video above, shot by the Center, veterinarians carefully observe her as she swims in her pool, assisting her where needed. Read more about Pacific White-sided Dolphins here.